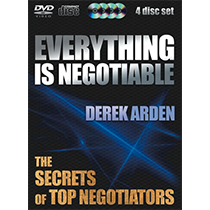 Discover the secrets of negotiating in today’s tough and sophisticated markets. Whether your a beginner or have considerable experience this easy to read book will help your skills, your results and your confidence. What do successful people say about Derek’s cutting edge negotiation skills and his unique ability to teach coach and advise clients? GET THE TRANSFORMATIONAL BUSINESS DEAL? What people say about Derek – John Shaw Finance Director – Oxfam – Derek’s negotiation skills helped Oxfam save £200, 000 on our bank charges. 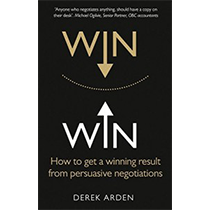 In this book you will find all you need to know to make you successful in all your negotiations Derek combines practical experience with academic research to make his keynotes, workshops and books a must for anyone who has to negotiate” Professor David Gray – Surrey University School of management. 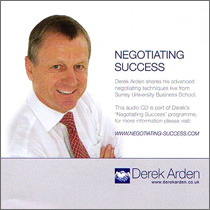 Derek Arden is a power negotiator. 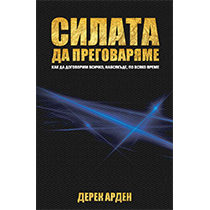 This book is written from experience gained negotiating at all levels of corporate and social life. It is packed with insights from helping others to negotiate and full of helpful tips that can be readily applied. For company directors negotiation is a regular necessity and this book contains sufficient examples of different negotiation styles and types to assist with most board-level negotiation scenarios, whether negotiating the CEO’s remuneration, reaching group consensus for board decisions or working as the team at the top when engaged in a complicated merger. 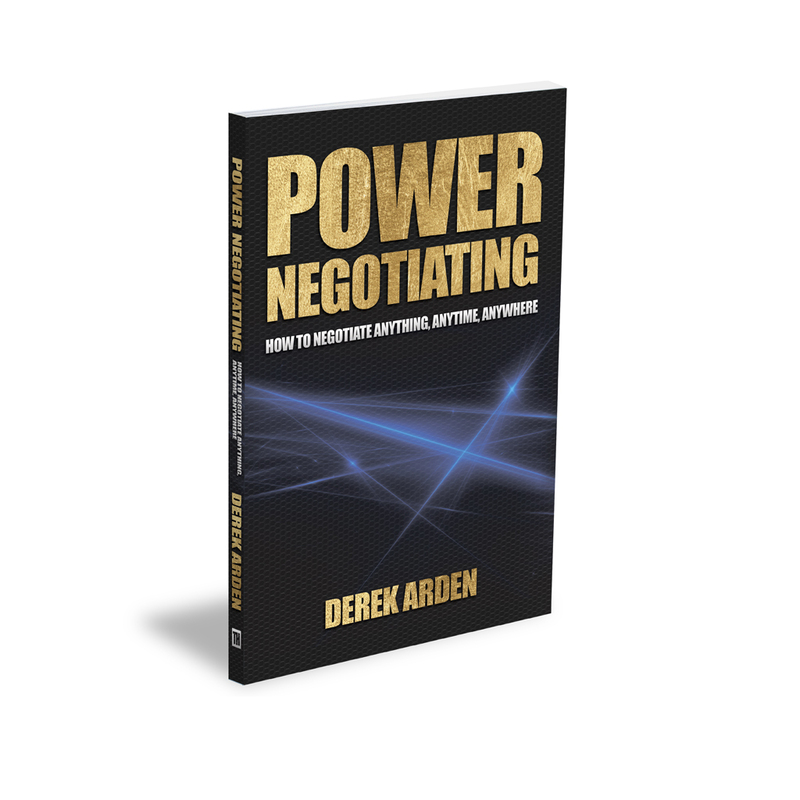 This book addresses the issue of power and its effect upon negotiations, techniques and tactics. It does not cut the complexity by assuming that all sides in a negotiation start with equal bargaining power, Instead it provides the tools required to effectively use the balance of power when it is in your favour or negate it when it is not. The strategies for creating options are valid and apply in myriad scenarios. The section on questioning is one of the best I have encountered. High quality questions take careful preparation. Under pressure, without preparation, it is usually difficult to ask the real well constructed tough questions, in a gentle non offensive way. The questions that will seek out the answer you need to hear to determine the truth. This book sets out a valid technique for developing high quality questions. Having asked the right questions it is important to then listen well to the answers. Observing carefully means listening carefully, watching the accompanying body language for congruence and noticing what is not said. Derek’s advice will serve directors well in normal board meetings as well as in negotiations. Again, the sound academic theory is backed up by personal experience, and will be easily applied. I hope I will never have to manage nine hours of silence whilst waiting for the answers (it could make board meetings far too long) but the knowledge that sometimes this is what is required to give the other party space will, if applied, make for better sharing of ideas and better generation of outcomes. The book is a gem, packed with nuggets of information, insights and practical tips. It is written to assist the reader in taking and applying the learnings and will benefit the entire board even if only one director reads it! * Julie Garland McLellan is a professional non-executive director, board and governance consultant and mentor. She is the author of “Dilemmas, Dilemmas: practical case studies for company directors“, “The Director’s Dilemma”, “All Above Board: Great Governance for the Government Sector” and numerous articles on corporate strategy and governance.